As clichéd as it sounds a picture really does paint a thousand words. Recently, I posted this photo to Facebook that generated over a thousand impressions and comments. The subject: Latinos and Jews. In my research for an upcoming book on the life and times of salsa music legend Larry Harlow, known as El Judio Maravilloso, (“the Jewish marvel”), I came across an interesting coffee table tome by Myrna Katz Frommer & Harvey Frommer “It Happened in the Catskills.” As I skimmed its chapters my eyes scanning the various black and white photos decorating many of the pages, I stopped at the Concord Hotel. There in the center of a packed ballroom, sitting at one of the tables, is a steamy looking Sid Caesar wailing his saxophone, oblivious to the shock and surprise of both the patrons and the uncredited band I recognized as Machito & his Afro-Cubans. The elegant ballroom with its draped columns, linen clothed tables littered with glass bottles, half-filled glasses, and a high coiffed, couture-styled clientele contained a common nightly summer ritual a mainstay of cultured entertainment, dining and dancing of the ‘50s & ‘60s: top comedian, a popular headliner and a Latin music orchestra. With close to 200 hotels in Upstate New York an hour north of the City stretched out over vast, verdant green acres of land between Monticello and Ellenville in Sullivan and Ulster County, the Catskills was the “Hamptons” of its time. Today the 85-year old trumpeter “Chocolate” Arementeros, considered the Afro-Cuban Louis Armstrong fondly recalls the Catskills Resorts of Upstate New York as close as he could get to Cuba without the palm trees. Just as the golden era of the big band sound ruled the airwaves of the 40s and 50s with Glenn Miller, Duke Ellington, Benny Goodman, and Stan Kenton standing by them was the rumba and the mambo! 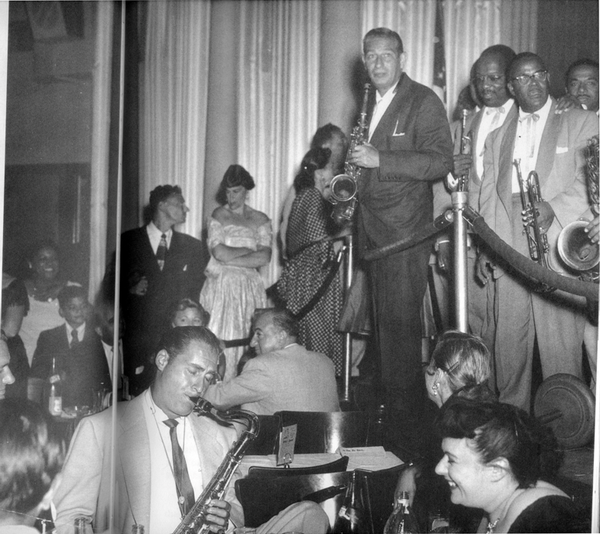 Each hotel had a rumba band in the lounge and a big band or orchestra in the ballroom for the evening show. Top bands played at different hotels every night. Jose Curbelo, Xavier Cugat, Tito Puente, Tito Rodriguez, and Machito were only some of the big names in mambo that played the Catskills. Latin music bands entertained at every bar mitzvah and Jewish wedding. Balding, middle-aged, overweight Jewish men twirled with beautiful women gliding around the floor as if they weighed 100 pounds. The mambo was the Jewish waltz. Incredible. Latino musicians grateful for steady work knew enough to play Hava Nagila to a mambo beat. As recent as last year, Harlow and his Latin Legends titillated the guests at the Bar Mitzvah for the son of Paul Schaeffer. With too many similarities to ignore, the vibrato voices of Spain’s rumba flamenca suggests the phrasing and timbre of Jewish cantors at temples. Puerto Rico’s mountain folk music has this “cantoric” flavor to its voices as if they sung at shul, emoting an intense pathos of passion, pain and struggle mixed in their history of survival. Echos of this synergistic dance between cultures and African races resonate through the Spanish cobblestones of Seville’s Cultural Corridor where King Ferdinand appointed a free black as governor over the mixed population as he plucked a Sephardic Jew for court musician and the first to set sail for America with Columbus.